When you right-click the Fretboard in the Staff view, the Fretboard pop-up menu appears, giving you choices for note editing, Staff view layout, and Fretboard appearance. Opens the Staff View Layout dialog box. 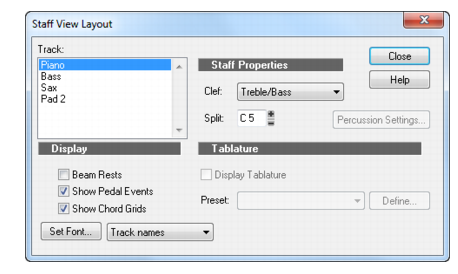 Controls which of the displayed tracks receive the notes you enter on the Fretboard. Saves the track in ASCII TAB format with the extension .txt. Inverts Fretboard so highest-sounding string appears at the bottom. Figure 509. The Staff View Layout dialog box. Select a track from the list (if the track you want to edit is not in the list, click the Tracks menu and choose Pick Tracks, then select the desired track). The Clef option shows the track’s clef. Select a new clef from the list. If you select Treble/Bass, select a Split point. C5 represents middle C.
If you select one of the Percussion options, click Percussion Settings to set up the appearance of percussion notes. Repeat steps 2-5 for other tracks. SONAR displays tracks using the new staff settings.